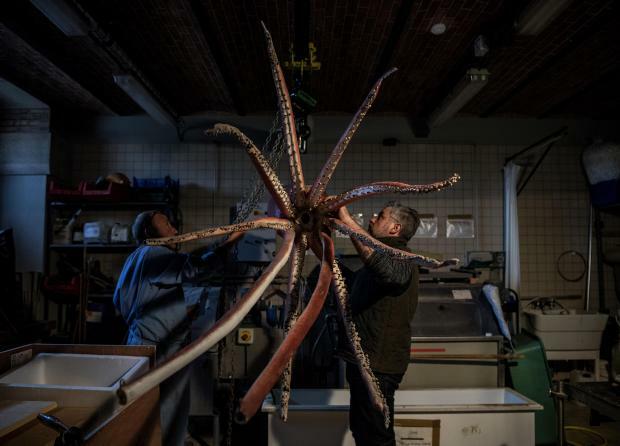 A little elbow grease, some formaldehyde, and a lot of ingenuity - that's what it took for taxidermists at the Museum of Natural History to prettify a giant squid along with a coelacanth, a rare fish known as the "living fossil". Six metres long - not counting its tentacles - and weighing in at 80 kilos, the squid, nicknamed "Wheke", hangs from a workshop during a recent visit, suspended on a pulley. "It's the real thing! ", enthused Christophe Gottini, who has been primping and plumping inert creatures at the museum for nearly half-a-century. "Aside from the eyes, which are not right at all," he added disapprovingly, knowing he still had time to get it right. "The squid looks as if it's having a psychotic episode." Before becoming a permanent exhibit, this dainty specimen - the largest grow up to 18 metres - lived off the coast of New Zealand, where it was caught in 2000. Stuffing an animal skin with a foam rubber replica - the classic method - doesn't work for squids, so Gottini opted for plastification, a technique perfected in Italy. Next up is the coelacanth, not one of the prettiest creatures on the planet. They stink too, exuding a foul oil that makes them inedible. Related to lungfish, coelacanths were long thought to have disappeared with the dinosaurs at the end of the Cretaceous, some 66 million years ago. But in 1938 an angler caught one off the coast of South Africa. Because that specimen matched fossils dating back several hundred million years, it became known as the "living fossil". It was a further two decades before any more coelacanths were discovered. Other species have now been discovered, showing that the fish has in fact evolved since then. The coelacanth under Gottini's care was in need of a serious makeover. The fish had spent 60 years in a tub of formaldehyde after scientists had removed its innards for research. They had not treated it gently. Long known to paleontologists, coelacanths are considered a kind of gap species between fish and the earliest tetrapods, which climbed out of the oceans to become Earth's first terrestrial vertebrates. Giant squids, by contrast, are almost certainly the largest of invertebrates, or animals without a backbone. Architeuthis dux likewise has the biggest eyes - the size of dinner plates - of any known creature. Their eight arms and two tentacles are lined with two rows of suckers, each with razor-sharp rings of chitin, the stuff of which insect exoskeletons are made. They latch onto prey with their feeding tentacles, pulling victims towards a powerful beak. Like other squid species, A. dux can squirt jet-black ink to scare off or confuse predators. Wheke and his nameless companion will be on display in Paris at the museum's Grand Hall of Evolution from April 3 to January 5, 2020.